She died shortly after deciding to forgo further medical treatment. Former first lady Barbara Bush died Tuesday. She was 92. Mrs. Bush served as the country's first lady from 1989 to 1993. She passed away shortly after deciding to forgo further medical treatments for her failing health. Mr. Bush is "broken-hearted to lose his beloved Barbara, his wife of 73 years," according to Jean Becker, chief of staff at the former president's office. "He held her hand all day today and was at her side when she left this good earth." While it's a "challenging time ... it will not surprise all of you who know and love him that he also is being stoic and strong, and is being lifted up by his large and supportive family," Becker said. Mrs. Bush's funeral will be held at St. Martin’s Church in Houston, where she and the former president have been devoted members for decades. Having been hospitalized numerous times while battling congestive heart failure and chronic obstructive pulmonary disease, she decided Sunday that she wanted to be "surrounded by a family she adores," according to an earlier statement released by Mr. Bush's office. 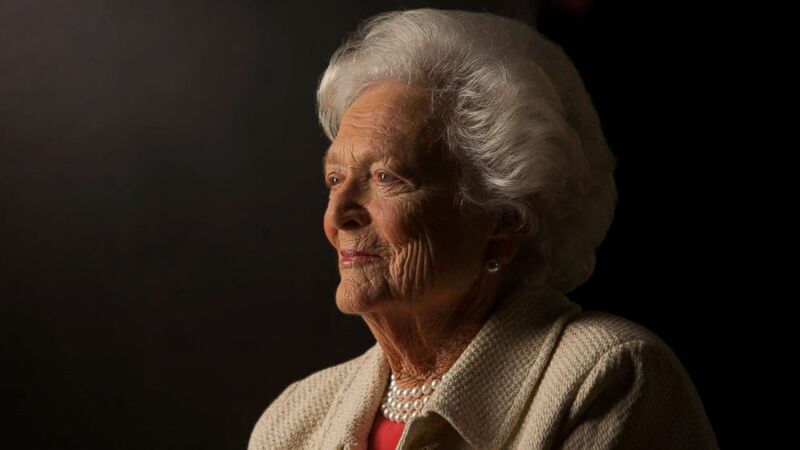 "It will not surprise those who know her that Barbara Bush has been a rock in the face of her failing health, worrying not for herself -- thanks to her abiding faith -- but for others," the statement continued. "She is surrounded by a family she adores and appreciates the many kind messages and especially the prayers she is receiving." In January 2017, Mrs. Bush and her husband were hospitalized at the same time. She was being treated for bronchitis and the nation's 41st president was being treated for pneumonia. Mrs. Bush is one of only two first ladies in the history of the country who is also the mother of a president. Abigail Adams, the wife of John Adams, a founding father of the nation and its second president, was the mother of John Quincy Adams, the sixth U.S. president. Mrs. Bush is the mother of George W. Bush, the 43rd president of the United States, and Jeb Bush, the former governor of Florida who ran for president of the United States in 2016. During her tenure as the nation's first lady, Mrs. Bush, the mother of six children, was a champion for global literacy and continued the work after she and her husband left the White House. In 1989, she formed the Barbara Bush Foundation for Family Literacy, which encourages parents to read to their children. "Literacy fits in with so many other things," she once told The Chicago Tribune. "If more people could read, fewer people would have AIDS. There would be less homelessness. I'm absolutely convinced of that." (Greg Smith/CORBIS/Corbis via Getty Images) President George Bush and First Lady Barbara attend the 1992 Republican National Convention in Houston, Texas. Bush, the GOP nominee for president, lost his second bid for office to democrat Bill Clinton. Barbara Pierce Bush was born in New York City, New York, on June 8, 1925, to Marvin and Pauline Pierce. Her father, a magazine publishing executive, was a descendant of Franklin Pierce, a Democrat and the nation's 14th U.S. president who served from 1853 to 1857. Her mother was the daughter of an Ohio Supreme Court justice and was active in civic causes. The third of four children, Bush later recalled a childhood where her parents would gather and read around the fireplace, fostering her early love of reading. She graduated high school from the all-girls private Ashley Hall boarding school in Charleston, South Carolina, in the early 1940s and enrolled in Smith College, a women's college in Northampton, Massachusetts. At Smith, which was racially integrated, Mrs. Bush became captain of the freshman soccer team, but she dropped out of college in 1945 at the beginning of her sophomore year. She later admitted that she was more interested in her future husband than in her studies. She had met George Herbert Walker Bush at age 16, while at a Christmastime dance at the Round Hill Country Club in Greenwich, Connecticut. The pair were immediately attracted to each other and began exchanging letters, even as Mr. Bush completed his training to become the then-youngest pilot in the Navy. He named his bomber plane "Barbara" in her honor. The pair were engaged shortly before Mr. Bush left to fly in World War II, and they wed Jan. 6, 1945, while he was on leave. Mr. and Mrs. Bush celebrated their 73rd wedding anniversary on Jan. 6. In an alumni magazine from Smith College, Mrs. Bush said the marriage has endured because of the couple's love for each other. 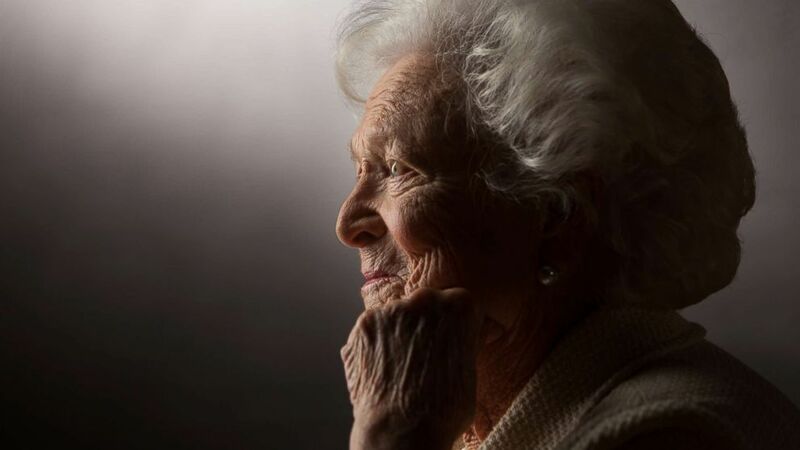 "I am still old and still in love with the man I married 72 years ago," she said in the interview published in "Smith Alumnae Quarterly" earlier this month. "George Bush has given me the world," she also said in the magazine. "He is the best -- thoughtful and loving." (David Hume Kennerly/Getty Images) Former First Lady Barbara Bush is interviewed for 'The Presidents' Gatekeepers' project about the White House Chiefs of Staff at the Bush Library, Oct. 24, 2011, in College Station, Texas. Mrs. Bush gave birth to their first child, future President George Walker Bush, on July 6, 1946, in New Haven, Connecticut. As the family moved about in Texas and California, the couple had five more children, who would eventually deliver the Bushes more than a dozen grandkids. Mrs. Bush took great joy in her family and told Barbara Walters in 1994, "If you opt to have children, I feel very strongly that they should be your top priority." The family was dealt a blow in October 1953, when daughter Pauline Robinson “Robin” Bush died of leukemia at age 3. "Because of Robin, George and I love every living human more," said Mrs. Bush, who became increasingly active in cancer research -- notably, the Leukemia Society of America -- following her daughter's death. After a failed senatorial bid, Mr. Bush was elected to the U.S. House of Representatives in 1966. He quit his job as an oil executive in Houston to relocate the family to Washington, D.C. In the 1970s, Mrs. Bush followed her husband from Washington, D.C., to New York City, to Beijing as Mr. Bush filled a succession of appointed political posts: ambassador to the United Nations, chairman of the Republican National Committee, head of the U.S. liaison office in Beijing and director of the Central Intelligence Agency. Mrs. Bush at that time volunteered at the Washington Home, a hospice where she bathed and fed the dying. (David Hume Kennerly/Getty Images) Former First Lady Barbara Bush is interviewed for 'The Presidents' Gatekeepers' project about the White House Chiefs of Staff at the Bush Library, Oct. 24, 2011 in College Station, Texas. Mr. Bush landed firmly in the public eye as he served as Ronald Reagan's vice president from 1980 to 1988, and he was elected as Reagan's successor and 41st president of the United States in 1988. 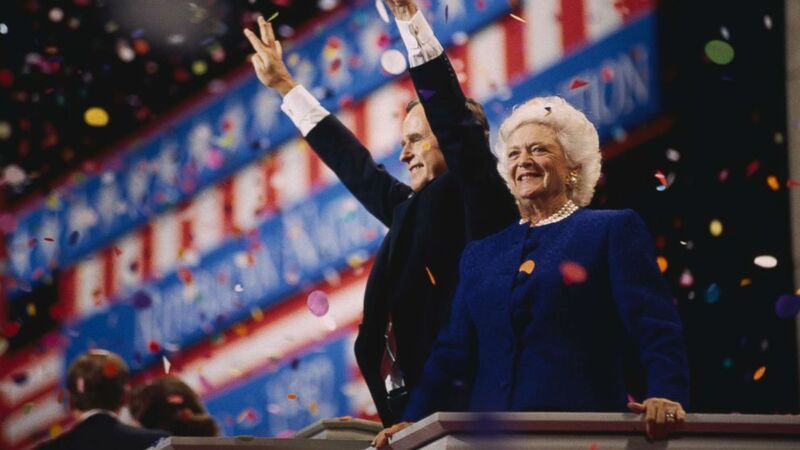 Mrs. Bush generated headlines herself in the 1984 Reagan-Bush re-election campaign by calling vice presidential nominee Geraldine Ferraro -- the first female vice presidential candidate from a major party -- something that "rhymed with rich." She later phoned Ferraro and issued a public apology. 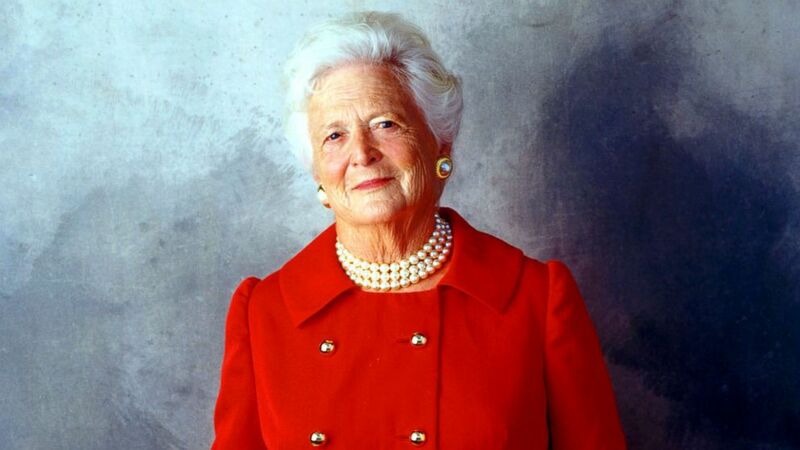 As first lady, Mrs. Bush pursued a passion to fight literacy and in 1989 formed the Barbara Bush Foundation for Family Literacy, which supported existing literacy programs to boost participant retention. Mrs. Bush believed that tackling illiteracy would also solve social issues that went unaddressed, such as AIDS, homelessness and teenage pregnancy. Her crusade against illiteracy and learning disabilities stemmed from her tireless efforts with her son Neil's dyslexia. "George Bush and I know the frustration of living with an undiagnosed or untreated learning problem, and we know the great joy and relief that comes when help is finally found," she wrote in a 1989 edition of "Their World," a publication of the National Center for Learning Disabilities. "I foresee the day when no American -- neither child nor adult -- will ever need to be limited on learning." Always standing proudly beside the president, Mrs. Bush maintained high popularity -- partly, she once said, "'Cause I'm fat and old and nobody feels threatened by me." In 1990, Mrs. Bush penned "Millie's Book", a best-seller attributed to the family's springer spaniel, Millie. It was her second book: in 1983, she published "C. Fred's Story", about the family's pampered cocker spaniel. The books reportedly generated more than substantial funds to Bush's literacy foundation. In 1992, Democratic Gov. Bill Clinton of Arkansas defeated Bush in his re-election to a second presidential term. The couple retreated to their estates in Houston and the family estate in Kennebunkport, Maine. (Pam Francis/Getty Images) Former First Lady Barbara Bush is seen on Aug. 23, 2001 in Houston. Mrs. Bush has had a long history of health problems, dating back to her time as the first lady. In 1989, she revealed that she suffered from Graves' disease, an autoimmune disorder that affects the thyroid. She later began taking medications for the disease and received radiation as part of her treatment. After experiencing abdominal pains in 2008, Mrs. Bush was hospitalized at Methodist Hospital in Houston. She underwent laparoscopic surgery to close a hole in her small intestine caused by an ulcer. That same year, she underwent precautionary open heart surgery at the same hospital to replace her aortic valve. Hospital officials reported that the procedure was a success. During her four years as the first lady, and eight years before that as the wife of the vice president in the Reagan administration, Mrs. Bush embodied what many believed to be the traditionally dutiful political wife: silent on most issues, but enthusiastically supportive of her husband and family. In her 1994 book -- "Barbara Bush: A Memoir" -- she revealed her pro-choice stance on abortion, a position that ran contrary to her husband's. She also reproduced an open letter to her children containing life's credo. "Value your friends," she wrote. "They are your most valuable asset. "Love your children," she added. "You are the best children any two people ever had. I know you will be as lucky. Your kids are great. Dad and I love them more than life itself."